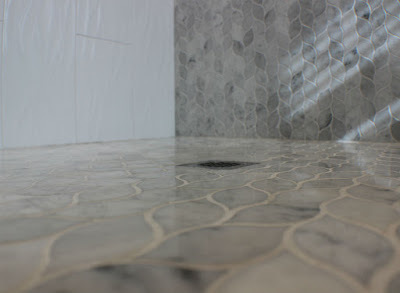 The recent shower renovation by Toronto Custom Concepts included this stunning floor tile selection. This marble leaf tile has a wonderful pattern to it and we were able to install it so that the floor tiles ran up the accent back wall with the same pattern for a continuity design effect. This would offset the white side shower that has porcelain tiles. Hope you like the design.